"How do you make a shooter that's not Call of Duty?" That was the question. The answer was something no-one saw coming. Whether Black Hawk Down or Saving Private Ryan, Fukuda’s previous work was built on grand cinematic touchstones. Titanfall was instead founded on its deceptively deep multiplayer, which featured such novel ideas as AI mobs and the interplay between hyper-manoeuvrable pilots and hulking mechs. It was fast, tactical and dynamic, and also a model of the reason why multiplayer-heavy games, like the Call of Duty series, feature expensive single-player campaigns. Titanfall lacked moments to breathlessly share around an office watercooler or be chewed over in op-eds. This wasn’t the only reason that, despite its strong sales, it quickly shed active players. But it was a significant one, and the first thing on Fukuda’s mind when, in the autumn of 2014, he began to think about what shape a Titanfall sequel should take. Looking for your next great shooter? The answer was in what amounted to a game jam, with members of the campaign development team being freed to experiment with design and technology. As a whole, the studio shucked away an internal expectation that the single-player campaign had to closely follow the rules of the multiplayer one, and began to tinker with ideas and build prototypes that might be stitched together and form the ‘movie’ of the game that Fukuda and co. thought so essential. Those first months of Titanfall 2’s development had few boundaries other than the object to use general Titanfall mechanics and its engine in interesting ways. “Some people did things with titans; some people did things with pilot mobility and wall-running; some people did things with puzzles,” says Fukuda. The prototypes the team were making were known internally as ‘action blocks’: discrete prototypes which would be eventually stitched together into a tightly controlled firework of a shooter campaign which throws idea after idea with almost Nintendo brevity; from time travel to transforming levels, leaping between spaceship troop carriers to Titan assaults. Then, the team started to figure out how to piece blocks together in a coherent way. Grenier’s crane puzzle became a chunk of the Beacon level. Slayback’s Pilot-throwing was chopped down, because the team found it difficult to implement into something interactive, into several cutscene sequences. But it was all very much founded on design, with the goal of building a game out of blocks of play. Most Titanfall 2 players would be hard-pressed to remember the details of its plot, which is mostly trying to keep up with making sense of the divergent ideas and set-pieces you face. Take, for example, the time travel that appears in Titanfall 2’s landmark level, Effect and Cause. For this section only, you are given the ability to instantaneously switch between time periods at an enemy facility; in the past it’s filled with scientists and soldiers and is gleaming new, and in the present it lies in ruins, and Respawn takes every opportunity to play with it, posing puzzles and combat challenges and little narrative details that make you realise that you’re actually causing all the destruction. It originated in an action block made by designer Jake Keating, and it immediately stood out to the team as something that should go into the game. Some members, in fact, felt that its mechanic should extend across the entire game. But rather than wring all they could from the mechanic, Keating and his group instead honed and cut it into the succinct and taut form it takes in the final thing. “Which is probably part of why people really like it,” says lead programmer John Haggerty. “Stretching it out might have been a bad thing anyway. And it was expensive to build, though not so much in terms of technology. “It’s a funny level because people often ask us how we do that, switching back and forth between timelines,” says Fukuda. “The answer is, well, we just made two buildings, one on top of the other, and teleport you up and down between them. It’s super simple.” But that meant that every location needed to be built twice, effectively doubling the workload. Instead of the overall plot, what sticks is the relationship the story strikes between the player and BT-7274, the Titan you pilot over its course. That it’d be a buddy story was the one element that was set from the start, with the arc taking players from the role of the prototypical shooter grunt to, by its end, a light-footed and multi-skilled Pilot. The idea was that the progress would mirror the experience of players coming into Titanfall 2 from playing Call of Duty. “That was the in-joke about who you are,” says Fukuda. BT is primarily a construction of animation, since its voice only came in right at the end of the game’s development. Even its name betrays BT’s developmental roots: “We called the Titan the ‘Buddy Titan’,” says Haggerty. The rest of the studio hated the name; Fukuda only managed to keep it by refusing to change until it was clear it didn’t present any problems, by which time everyone had acclimatised to it. Animator Shawn Lee Wilson would normally work to voice performances, but without one to animate to he had to bounce ideas off Fukuda and construct BT as he went along, watching Akira Kurosawa films and tracing lines between Clint Eastwood and Sam Elliott cowboy roles to figure out its physical character, and expressing it entirely through its physical performance. Lee Wilson took over the studio’s motion-capture room to act out BT’s run, walk and gestures, embodying its great power and grace, steadily narrowing towards setting the strong and reassuring presence it has in the final game. “It was important that the player felt reassured, because you’re going to be this person stranded behind enemy lines, marooned with this strange robot,” says Fukuda. 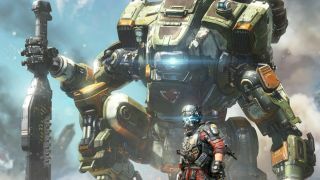 “There’s a sense that, as the new player to Titanfall, you needed someone you could trust, someone reliable and safe.” In the first iterations of BT’s script, however, it erred towards the bossy. They wanted to avoid Optimus Prime, and they also needed it to perform the role of the player’s main objective-giver. Part of the solution was to create conversations between player and mech, intended as a way of strengthening their bond with BT without resorting to cutscenes. But they raised some controversy in the studio: if they were making Half-Life, shouldn’t they have a silent protagonist? When the script had BT asking if the player was OK after they’d fallen down a pit, Fukuda realised there was room for a response from the player character. These moments of dialogue choice are a minor flourish for a game that’s about wall-running across chasms and giant mechs hitting each other with swords. But they give a little space for self expression, and even a gently progressive air among all the bullets, following the same path (if to a very different destination) as games like Kentucky Route Zero. Accidentally. “Actually, I played Firewatch long after the game shipped and I didn’t know about it at the time, but, ‘Oh, these guys did it already!’”, Fukuda says. Much of the flexibility with which the pieces of Titanfall 2’s campaign came together is a direct result of its engine, which allows designers a great deal of power to script their own levels. The engine is Source, which powers Half-Life 2 and Portal 2, but was heavily modded to build the original Titanfall. During the making of the first game, Haggerty and his team had entirely broken the original Valve code that saves and loads level progress. Back then it wasn’t necessary for a multiplayer game, but to reinstate it for the sequel’s campaign was a huge hurdle. The scripting system was entirely made by Respawn, too, and it enabled designers to construct even Titanfall 2’s most technical-seeming moments. Effect And Cause was not the work of programmers but of its designer, Jake Keating. Looking back at the way Titanfall 2’s campaign is constructed of hundreds of little blocks of play, it’s clear that it’s enabled by the fact its designers could quickly produce their own divergent takes on what mechs and Pilots can do. There’s one sequence during Into The Abyss, in which prefabricated chunks of buildings and ground construct themselves into the level around you for a single encounter, before it whisks you on to something completely new. It embodies the spirit of Titanfall 2’s campaign: it’s a game about hyperactive movement and thundering power, built from one dazzling set-piece after another.